Exclusive and home-like. Brand-new, two-story condo at Jardines del Mar, a small high-end development, private and relaxing. Two hundred yards from Eagle Beach, the best beach in Aruba, but off the main road in a quiet location. The property is fully enclosed and secure, with concierge service, private parking within the grounds, and beautiful courtyard/garden, which forms a natural extension of the front patio. On the first floor is the living room with an LCD TV/Cable and sitting area, dining area, fully equipped kitchen, laundry room with washer and dryer, and a half-bathroom. The second floor has two bedrooms with two full bathrooms and ample storage space. A balcony looks to the grounds and the swimming pool. There are two patio areas, one on each side of the house, with tables and chairs. Amenities include a comfortable and relaxing pool side with a covered sitting area; a gym with weights and work-out equipment; a common covered outdoors party room; an outdoors grilling and baking station; high-speed Wi-Fi service; and one of the most luxurious gardens on the island. The area of the property is that of low-rise hotels, where the best beaches on the island are found. A recently opened scuba diving school is next door. Several fashionable restaurants are within walking distance, including Chalet Suisse and The Screaming Eagle. Downtown Oranjestad, shopping areas, two new popular malls, and most other island attractions are within 5 to 10 minutes by car. Short term, extended stay and long term rentals are available. All prices are approximate, negotiable and subject to change until final booking. Discounts for single travelers and couples. Exclusive location, gaited private development.a lot of space.fully furnished.very clean. Everyone that we meet at the condo property was very friendly and fun to spend specialtime with. Maggie, our contact person was fabulous, always ready to assist us in any way she could.... condo was very clean. Aron, the owner was always ready to assist throughout our entire process of booking the condo, as well as any other questions we had regarding our stay in Aruba. A very, very nice place!!! This condo is located in a very beautiful and quiet complex. The condo itself is very clean and comfortable and has everything you might need. It is a very easy and short walk to a quiet part of the beach (which is what we love!) with huts for shade and you can rent beach chairs. There are 2 very good restaurants within a 5 minute or less walk from the condo which is nice. However if you choose to go downtown to eat and you choose not to rent a car (we did not rent a car) a taxi will pick you up in about 2-3 minutes from the time you call them! The owner was very helpful by answering all of my questions and making us feel comfortable coming to Aruba for our first time. The condo caretaker was wonderful!!! And she was always available when we needed her. I would most definitely recommend staying in this condo if you are going to Aruba...I would definitely stay there again!!! This was our first time in Aruba. We had a great time staying at this place. Great condo facilities, safe, good neighbors, clean, safe place to park car. Close to the beach and its activities. Good restaurants, Eagle beach, Palm beach, grocery stores, coffee shops, bike paths, casino, etc. Owner and the condo care-taker did a great job providing us the guidance before and during our stay. 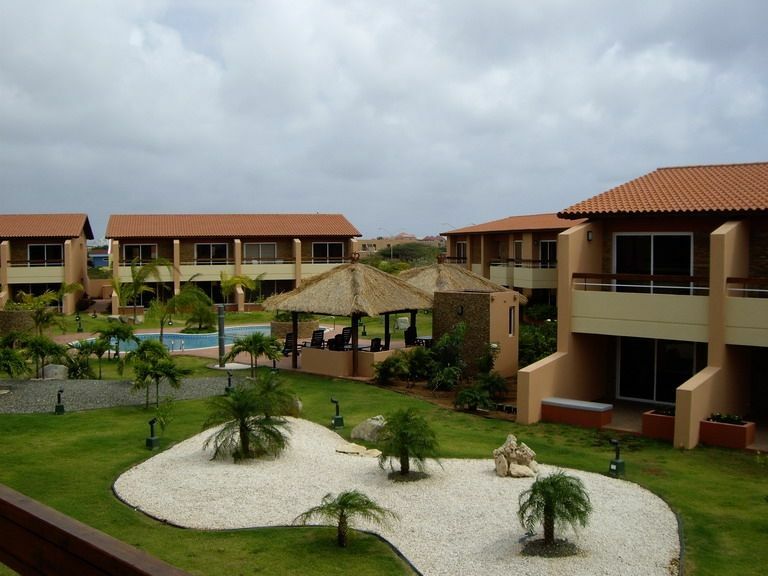 We have been looking to rent a property in Aruba for a family of 5 ( 2 adults and 3 kids)- hotel rooms seem like a small space for us, so we searched around and found this GEM in ARUBA. The owner of the property is the most wonderful, helpful, honest and genuine person. He was very helpful in booking the property as well as supplying us with the details on the area, beach and other amenities. This townhome is gorgeous inside and out- located in the beautiful part of eagle beach, walking distance -easy access with even kids! Beautifully manicured property, pool, garden- the unit has everything you need (kitchen, amazing patio to eat breakfast, clean rooms, towels, etc). We loved every day we spent in this property and already talking on coming back! Aruba is a beautiful and unforgettable country- and the place we stayed in made it even more unforgettable! Thank you for a superb vacation! The perfect getaway with a great location! Our family of five just returned from a wonderful stay at this immaculate, spacious condo that has an ideal location that's an easy one block walk from the best beach on the island: Eagle Beach. The homeowner could not have been more attentive and helpful. We were pleasantly surprised at how well equipped the condo is--we were able to cook many of our own meals and even do laundry! We highly recommend renting a car to explore other parts of the island, especially for snorkeling and dining out. Overall, a great stay and we would highly recommend this well-situated rental. Best kept secret on the Island. We enjoyed staying at this lovely 2bdrm. 2.5 bath condo, just a stones throw to the best beach on Auba,eagle beach.The security at this complex is superb,the amenities are great,and overall it is a great place to stay whether it be weekly or long term as we did.